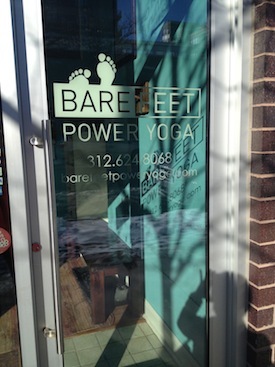 Not a stranger to hot yoga, I was excited to hear about a new boutique-style hot yoga studio in the west loop. Thanks to a friendly Facebook shout out by Cheeky Chicago’s Jessica Zweig, I found myself adding Bare Feet Yoga to my #TryFitWeekly to-do list. While I at first tried to make a Friday night class, the west loop traffic and Friday night parking prevented me from making it on time. But that didn’t deter me. 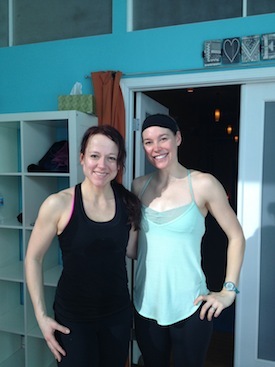 I instead trekked into the winter cold to make the Saturday 12:30pm Power Hot Yoga class (90 degrees) with Robin. This class, jam-packed with inversions, core strengthening and crow-to-chaturanga-style power moves, seemed just the right dose of strengthening I was looking for. 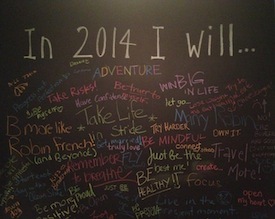 with its chalkboard full of positive affirmations. From the start of class, Robin’s optimistic nature made me feel welcome and ready to try new things. She instructed us to set an intention for the practice and then primed us for inversions with a series of core exercises. And then we were off! After a modest Sun A flow, we transitioned into Sun B, handstands, crow, side crows, side planks, headstands and moves I had never seen before! The poses were as mentally challenging as they were physically challenging. During a simple Goddess pose, she had us place our middle fingers to our thumbs for the mudra of patience. I laughed inside, as patience is something I have to practice every day. When it was time for savasanna (end of class resting pose), I had conflicting feels of longing to continue-yes, even beyond the 90-minute class and thoughts of, “This is the longest savasanna of my life.” Thankfully I remembered our patience mudra, refocused and then nearly fell into a short sleep like the softly-snoring yogi behind me. Class was just what I needed! This particular Power Yoga class is open to everyone of all levels but I would recommend it to someone who has practiced yoga before. Also, first-timers have the option to purchase 30 days of yoga for just $30. Totally worth it! Thank you for this awesome review!!! I would love to have you back for class… I think you would love Rock Your Core. Thanks Robin! I hope to be back very soon!